Below we have listed other available rehabilitation literature. If you are aware of articles, reports, or books relevant to this region that are not listed here, please let us know (AUTHORS). Agee, J.K. 2002. Fire as a coarse filter for snags and logs. Pp. 359-368 in Ecology and management of dead wood in western forests. USDA Forest Service, Pacific Southwest Research Station, General Technical Report, PSW-GTR-181. Full Text (.pdf). Anderson, B., and D. F. Potts. 1987. Suspended sediment and turbidity following road construction and logging in western Montana. Water Resources Bulletin 23:681-690. Beschta, R. L., C. A. Frissel, R. Gresswell, R. Hauer, J. R. Karr, G. W. Minshall, D. A. Perry, and J. J. Rhodes. 1995. Wildfire and salvage logging: recommendations for ecologically sound post-fire salvage logging and other post-fire treatments on federal lands in the west. Bitterroot National Forest. 2000. Bitterroot Fires 2000: An assessment of postfire conditions with recovery recommendations. USDA Forest Service, Bitterroot National Forest. Unpublished Report. FULL TEXT (.pdf). Blaisdell, J. P. 1949. Competition between sagebrush seedlings and reseeded grasses. Ecology 30:512-519. Bonnet, J. L. 2000. Conservation of wood by water spraying: limiting the environmental impacts. CTBA Info. 83:2-3. Boss, A., M. Dunbar, J. Gacey, P. Hanna, M. Roth, and O. D. Grossarth. 1983. Elk-timber relationships of west-central Idaho. USDA Forest Service, Boise and Payette National Forests, USDI, and BLM. Brais, S., P. Davis, and R. Ouimet. 2001. Impacts of wild fire severity and salvage harvesting on the nutrient balance of jack pine and black spruce boreal stands. Forest Ecology and Management 137:231-243. Briese, D. T. 1996. Biological control of weeds and fire management in protected natural areas: are they compatible strategies? Biological Conservation 77: 135-41. Cattelino, P. J., I. R. Noble, R. O. Slatyer, S. R. Kessell. 1979. Predicting the multiple pathways of plant succession. Environmental Management 3:41-50. Cavanagh, N., T. McDaniels, L. Axelrod, and P. Slovic. 2000. Perceived ecological risks to water environments from selected forest industry activities. Forest Science 46:344-355. Collins, B. D., and T. Dunne. 1988. Effects of forest land management on erosion and revegetation after the eruption of Mount St. Helens. Earth Surface Processes and Landforms 13:193-205. Cromack, K. Jr., Landsberg, J. D., Everett, R. L., Zeleny, R., Giardina, C. P., Strand, E. K., Anderson, T. D., Averill, R., and Smyrski, R. 2000. Assessing the impacts of severe fire on forest ecosystem recovery. Journal of Sustainable Forestry 11:177-228. Cullen, S.J. , C. Montagne, and H. Ferguson. 1991. Timber harvest trafficking and soil compaction in Western Montana. Soil Science Society of America Journal 55:1416-1421. D'Antonio, C. M. 2000. Fire, plant invasions, and global changes. Pp. 65-93 in H. A. Mooney and R. J. Hobbs, editors, Invasive species in a changing world. Island Press, Washington, D. C., USA. DellaSala, D. A., and D. M. Olson. 1996. Seeing the forests for more than just trees. Wildlife Society Bulletin 24:770-776. DeLong, S. C., and W. B. Kessler. 2000. Ecological characteristic of mature forest remnants left by wildfire. Forest Ecology and Management 131:93-106. DeLuca, T. H. 2001. Assessment of the USFS Soil Quality Standards and the application of those standards to the Pink Stone Environmental Impact Statement. A report to The Ecology Center, Inc.
Elliot, W., and L. Tysdal. 1999. Predicting sedimentation from forest roads. Journal of Forestry 97:23-29. Field, D. 1991. Grass seeding for wildfire rehabilitation: science and policy. M.S. Thesis, University of Montana, Missoula. 109 pp. Flint, L. E., and S. W. Childs. 1987. Effect of shading, mulching and vegetation control on Douglas-fir seedling growth and soil water supply. Forest Ecology and Management 18:189-203. Forman, R., and L. Alexander. 1998. Roads and their major ecological effects. Annual Review of Ecology and Systematics 29:207-231. Franklin, J. F., H. H. Shugart and M. E. Harmon. 1987. Tree Death as an Ecological Process (The causes, consequences, and variability of tree mortality) BioScience 37(8):550-556. Gibson, K., E. Leiser, and B. Ping. 1999. Bark beetle outbreaks following the Little Wolf Fire. USDA Forest Service Northern Region, Forest Health and Protection Report No. 99-7. Hobbs, R. J. and L. F. Huenneke. 1992. Disturbance, diversity, and invasion: implications for conservation. Conservation Biology 6:324-37. Kotliar, N. B., S. J. Hejl, R. L. Hutto, V. A. Saab, C. Melcher, and M. McFadzen. In Press. Effects of wildfire and post-fire salvage-logging on avian communities in conifer-dominated forests of the western United States. Studies in Avian Biology. Losensky, B. J. 1987. An evaluation of noxious weeds on the Lolo, Bitterroot, and Flathead Forests with recommendations for implementing a weed control program. Luce, C. H., B. E. Rieman, J. B. Dunham, J. L. Clayton, J. G. King, T. A. Black. 2001. Incorporating aquatic ecology into decisions on prioritization of road decommissioning. Water Resources Impact 3:8-14. Luce, C.H. and T.A. Black. 2001. Spatial and temporal patterns in erosion from forest roads. Pp. 165-178 in M.S. Wigmosta and S.J. Burges, editors, Influence of urban and forest land uses on the hydrologic-geomorphic responses of watersheds. American Geophysical Union, Washington, D.C., USA. Lukac, T., and J. Tajbos. 2001. Qualitative and value structure of timber from salvage fellings in protective forests. Journal of Forest Science 47:181-189. Madej, M. 2001. Erosion and sediment delivery following removal of forest roads. Earth Surface Processes and Landforms 26:175-190. Marzluff, J. M., J. J. Millspaugh, K. R. Ceder, C. D. Oliver, J. Withey, J. B. McCarter, C. L. Mason, and J. Comnick. 2002. Modeling changes in wildlife habitat and timber revenues in response to forest management. Forest Science 48:191-202. McDonald, ?. 1986. Grasses in young conifer plantations: hindrance and help. Northwest Science 60:271-278. McIver, J. D., and L. Starr. 2000. Environmental effects of postfire logging: literature review and annotated bibliography. USDA Forest Service Pacific Northwest Forest Experiment Station, General Technical Report PNW-GTR-486. FULL TEXT (.pdf). Megahan, W., M. Wilson, and S. Monsen. 2001. Sediment production from granitic cutslopes on forest roads in Idaho, USA. Earth Surface Processes and Landforms 26:153-163. Megahan, W. F., and D. C. Molitor. 1975. Erosional effects of wildfire and logging in Idaho. Irrigation Processes and Drainage, American Society of Civil Engineers 423-444. Meyer, V., E. Redente, K. Barbarick, and R. Brobst. 2001. Biosolids applications affect runoff water quality following forest fire. Journal of Environmental Quality 30:1528-1532. Moore, J. R., D. A. Maguire, D. L. Phillips, and C. B. Halpern. 2002. Effects of varying levels and patterns of green-tree retention on amount of harvesting damage. Western Journal of Applied Forestry 17:202-206. Pratt et al. 1984. Buried viable seed in a ponderosa pine community. Canadian Journal of Botany 62:44-52. Prestemon, J. P., and T. P. Holmes. 2000. Timber price dynamics following a natural catastrophe. American Journal of Agricultural Economics 82:145-160. Radeloff, V. C., D. J. Mladenoff, and M. S. Boyce. 2000. Effects of interacting disturbances on landscape patterns: budworm defoliation and salvage logging. Ecological Applications 10:233-247. Reunhardt, E. D. 1998. Analyzing effects of management actions including salvage, fuel treatments, and prescribed fire on fuel dynamics, and fire potential. Pp. 206-208 in T. Pruden and L. A. Brennan, Tall Timbers Fire Ecology Conference. Tallahassee, Florida, USA. Rieman, B. E., D. Lee, G. Chandler, and D. Meyers. 1997. Does wildfire threaten extinction for salmonids: responses of redband trout and bull trout following recent large fires on the Boise National Forest. Pp. 47-57 in J. Greenlee, editor, Proceedings of the Second Biennial Conference on the Greater Yellowstone Ecosystem: The Ecological Implications of Fire in Greater Yellowstone. International Association of Wildland Fire, Fairfield, Washington, USA. Richardson, R. 2001. Burned area recovery final environmental impact statement: Sula, West Fork, and Stevensville Ranger Districts, Bitterroot National Forest, Ravalli County, Montana. Unpublished report on file at: USDA Forest Service, Bitterroot National Forest, Hamilton, Montana, USA. Rothrock, J., P. Barten, and G. Ingram. 1998. Land use and aquatic biointegrity in the Blackfoot River watershed, Montana. Journal of the American Water Resources Association 34:565-581. Stankey, G. H., B. T. Bormann, C. M. Ryan, B. Shindler, V. Sturtevant, and C. Philpot. 2002. Adaptive management and the Northwest Forest Plan: rhetoric and reality. Journal of Forestry 101:40-46. Stark, N., and J. Sasich. 1984. Studies of soil impacts in a Ninemile Creek Watershed Plantation. Unpublished report on file at: USDA Forest Service, Lolo National Forest, Missoula, Montana, USA. Stuart, J. D., M. C. Grifantini, and L. Fox, III. 1993. Early successional pathways following wildfire and subsequent silvicultural treatment in Douglas-fir/hardwood forests, NW California. Forest Science 39:561-572. Taskey, R. D., C. L. Curtis, and J. Stone. 1989. 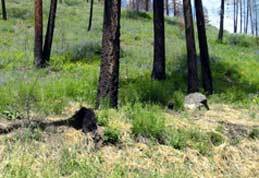 Wildfire, ryegrass seeding, and watershed rehabilitation. Pp. 115-124 in Symposium, Fire and Watershed Management. USDA Forest Service, Pacific Southwest Research Station, General Technical Report, PSW-109. Trombulak, S.C and C.A Frissell. 2000. Review of ecological effects of roads on terrestrial and aquatic communities. Conservation Biology 14:18-30. Whittle et al. 1997. The importance of buried seeds and vegetative propagation in the development of postfire plant communities. Environmental Review 5:79-87. Wichman, L., and H. P. Ravn. 2001. The spread of Ips typographus (L.) (Coleoptera, Scolytidae) attacks following heavy windthrow in Denmark, analysed using GIS. Forest Ecology and Management 148:31-39. Wright, H. A., F. M. Churchill, and W. C. Stevens. 1982. Soil loss and runoff on seeded vs. non-seeded watersheds following prescribed burning. Journal of Range Management 35:382-385. Wylie, F. R., B. Peters, M. DeBaar, J. King, and C. Fitzgerald. 1999. Managing attack by bark and ambrosia beetles (Coleoptera: Scolytidae) in fire-damaged Pinus plantations and salvaged logs in Queensland, Australia. (Source?) 62:148-153.